This year I am trying to adhere to Michael Pollan’s tenant of only eating junk food I make myself. This has been very hard as a lover of all fried food, but I think understanding how things are made – and what’s in them – is an important component of eating healthy. Breading is normally a pain, but this recipe minimizes the steps with a simple batter, though the frying takes some time. Look for unbromulated, unbleached white flour – Bob’s Red Mill is my favorite. Serve with your favorite dipping sauce and enjoy. Note that one large onion makes a shocking amount of rings but you can double the proportions for a crowd. 1. Cut the ends of the onion and remove the outer papery layer. Cut the onion lengthwise into 1/2 inch slices and separate the rings. 2. Mix all dry ingredients together, then slowly add in seltzer, whisking as you go. Add additional seltzer as needed – the batter should be thick and without clumps. 3. Drop the onions rings into the batter and let sit for a moment. 4. Pour canola oil to depth of 1″ in a heavy bottomed skillet over medium-high heat. 5. Test temperature of oil by spooning a drop of batter into pan. The oil is ready when the batter sizzles and floats. 6. 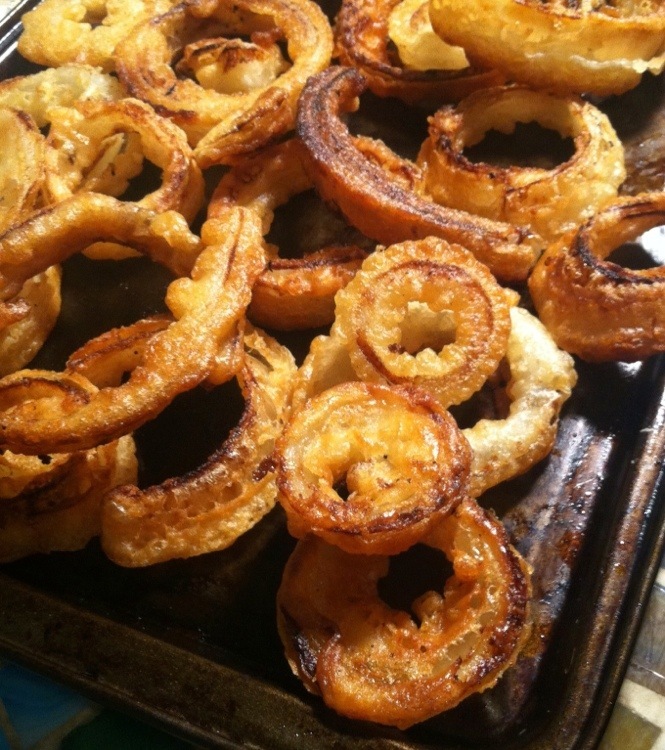 Fry onion rings in batches of three or four, about one to two minutes per side. The onion rings are ready when golden – do not crowd the pan or the temperature of the oil will drop and your rings will be soggy! Add more oil to the pan as needed throughout the frying. 7. Drain cooked onion rings on a paper towel. *To reheat leftovers, place onion rings on a wire rack over a baking sheet and place in oven set to a 200 F til warmed through.